April 28, 2018 - There is nothing more relaxing than the thought of taking a shower after a long, tiring, stressful day. But it becomes nightmarish if you have clean water problems because hard water that features a bad smell running all over your body is not exactly the best thing that can happen to you. There are several ways to purify water, but almost none can solve the problem of hard water that comes from showers, whether hand-held or shower heads. SOPNOLA has provided a solution to the issue of shower water purification with the ultimate shower water filter that removes chlorine, impurities, and odors. This 10 stage shower water filtration System on which the Sopnola Shower Filter operates will safely and effectively remove anything that may lead to itchy skin, eczema, bronchitis, and dandruff. The Sopnola Shower Water Filter comes offers a seamless design which will also save you time and effort as it takes no more than a couple of minutes to install. No complex installation procedures and no complex tools needed for the installation of the shower water filter. 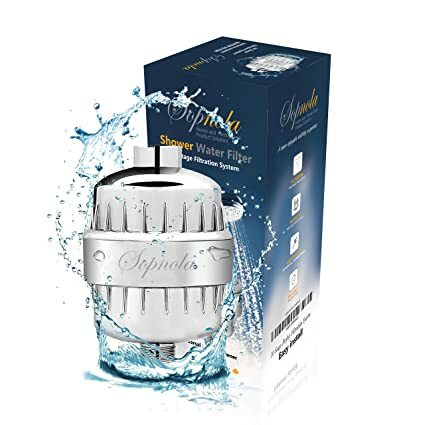 Also, SOPNOLA GLOBAL has thought about you the customer and what it might take you to replace the cartridges already installed in the shower water purifier and has provided along with each shower water purifier to be purchased, 2 replacement cartridges at no additional charge. Each cartridge will last for six months so each set purchased has the customer covered for the next year. Filtered shower water has lots of benefits as it is kinder to our bodies and is beneficial for people suffering from flaky scalp, dry skin, dandruff, and eczema as well as reducing the risk of inhaling chlorine which poisons the body and can cause blurred vision and blisters on the skin as well as coughing and chest tightness.